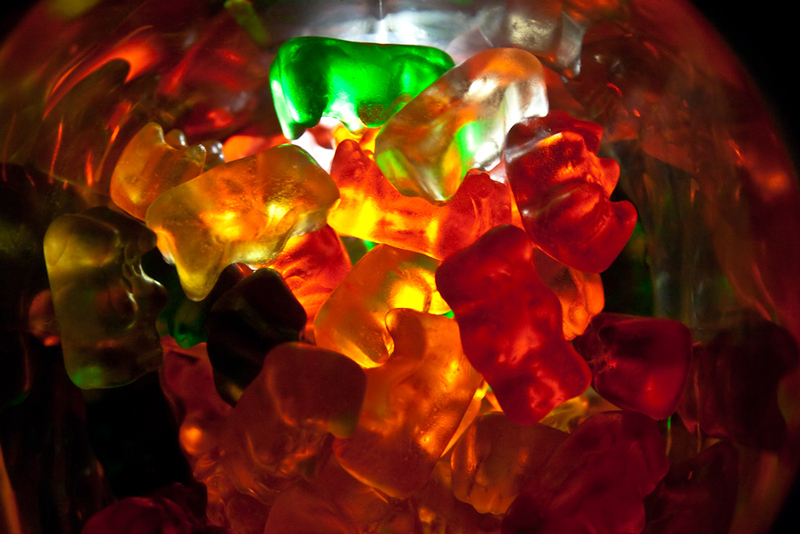 Photo courtesy of Steven Depolo/Flickr Flakka can take form as gummy bears. He desperately needed help. Being chased by invisible people who were out to hurt him, his only option was to get to the police, only he couldn’t figure out how to get inside the station. With the invisible people getting closer, he tried to scale the fence to gain some protection. Almost making it, his foot slips and his body is impaled by the fence, dangling there without any leverage. He is helpless, he is on flakka, and it is all caught on tape. Flakka, a new type of synthetic cathinone, is similar to what is known as bath salts. Its chemical name is alpha-pyrrolidinovalerophenone (alpha-PVP). This drug comes in crystal form and can be eaten, snorted, injected or smoked. According to the National Institute on Drug Abuse, “Like other drugs of this type, alpha-PVP can cause a condition called “excited delirium” that involves hyper stimulation, paranoia, and hallucinations that can lead to violent aggression and self-injury.” On the streets it’s called five-dollar delirium. In April, Australian News stated, “There has already been a 780 percent increase in the number or reported cases in the last three years. But police in the US fear that could just be the tip of the iceberg with the worst yet to come.” And they were right. Lynne Grubb, a clinical specialist in the emergency center at Broward County Medical Center, gave some more information regarding the number of people abusing flakka. As many as 14 cases of people on flakka come in everyday, Grubb said. In the past two months, the hospital started tracking patients who come in on flakka. They have tracked at least 50 cases a week, averaging about 200 cases a month. The Fort Lauderdale Police Department held a meeting with the hospital to share its concern that that number will grow. During a presentation, Grubb also explained how medical communities nationwide are looking to their county for answers. “With side effects more deadly than cocaine and bath salts, it’s considered to be one of the most dangerous street drugs out yet,” Grubb said. This drug can give users hulk-like strength. CBS News interviewed epidemiologist at Nova Southeastern University, Jim Hall, who described this symptom as excited delirium. The body goes into hyperthermia; the person may become psychotic and attain adrenaline-like strength. It can take as many as eight officials to hold one person down. Flakka is most popular in the 18-30 year old range, although cases have been reported of all different ages according to the presentation given at Broward County Medical Center. One problem in particular about the drug is that it doesn’t appear on toxicology screenings. The only way of knowing if a patient has taken flakka is if bystanders or themselves tell the authorities or doctors. As crazy as that story sounds, that is only one of many. Several cases have been reported where users of this drug are running around naked and yelling at imaginary pursuers. Jones went on to explain that being addicted to drugs distorts your mind to the point where the only thing you think about is getting your next fix to get high. “You always try to chase that stronger, more intense high,” Jones described. Because the flakka is so cheap, there’s a low barrier to entry. Sheila Goertemoeller, a pharmacist for Cincinnati Children’s Hospital, wrote a blog post about flakka. She wants to warn parents about how accessible this drug is, letting them know how quickly this drug is spreading across the nation. “…News outlets have reported cases of human exposure in Florida, Tennessee, Kentucky and Ohio,” Goertemoeller writes. Her hospital also wrote about the drug in their quarterly newspaper. “Alpha PVP is now a federally controlled substance. It has been identified in drug seizes since 2011 where it initially showed up in Nebraska. By 2012, Alpha PVP was discovered in 20 states,” it said. Evidence shows that this drug is on the rise and it’s not going away any time soon.